SETH’S PICK :: CAPTAIN MARVEL #1: The former Ms. Marvel has been enjoying a resurgence in recent years, and that can largely be attributed to the work of writer Kelly Sue DeConnick. 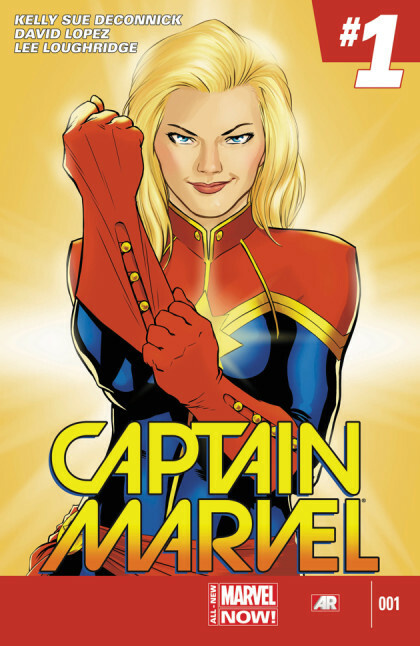 Her last Captain Marvel series was as much a character study as it was an entertaining super hero romp. For this new relaunch, DeConnick is teaming with David Lopez, an artist who, though he might not be a household name, has well established himself as a reliable and gifted artist. Now, I know there are some among you who are weary of the increasing number of relaunches or new #1 issues. Recent weeks have proven, however, that it’s worth giving some of them a look. The recent debuts of She Hulk, Wolverine and the X-men, Ms. Marvel, and Moon Knight have all acted as reminders that there are plenty of opportunities for genuinely fun new comics. I’d also like to point out that DeConnick is writing at the top of her game at the moment. Her Image series Pretty Deadly remains a category-defying series that is also well worth your patronage. With DeConnick’s momentum and the looming probability that Captain Marvel might appear on the big screen, it’s a good time to catch up with the character.